Scientists, industry-leaders and policymakers gathered in Paris on Friday to discuss the economic potential of resource efficiency, as well as its role in limiting global warming and putting the world on a more sustainable, equitable development track. The event was part of UN Environment’s on-going dialogue with business to address environmental sustainability. In his opening remarks, Erik Solheim, Head of UN Environment, said the world had shown that it was able to solve environmental issues, but it could not do this without business. 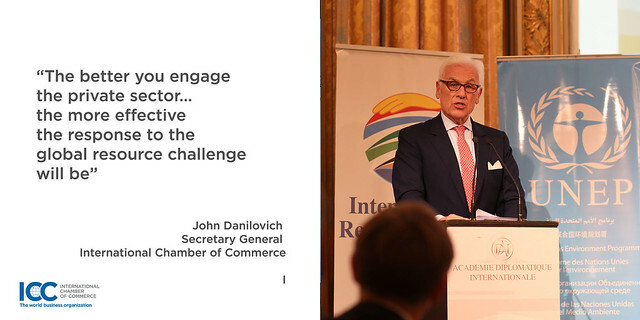 John Danilovich, Secretary General of the International Chamber of Commerce, said ICC was committed to responsible business conduct. He said the business vision for progress comprised three key concepts: innovation, collaboration and regulation. “Businesses are already innovating to develop the technological, organisational and financial solutions needed to achieve resource efficiency but to scale up these solutions we need enhanced collaboration between business and, just as importantly, between the public and private sectors,” he said. Businesses are already innovating to develop the technological, organisational and financial solutions needed to achieve resource efficiency but to scale up these solutions we need enhanced collaboration between business and, just as importantly, between the public and private sectors. Laurent Tapadinhas, Deputy Commissioner General, Ministry of Environment, Energy and the Sea, said France was very receptive to the messages of the International Resource Panel. He said France wanted to be a laboratory for “decoupling”, a term used by the International Resource Panel to describe the breaking of the link between rising economic growth and harmful environmental impacts. Pascal De Petrini, Executive Vice-President, Strategic Resource Cycles at the French food products multinational Danone, said the company wanted to work in a circular economy way to manage milk, water and plastics. The 120-strong gathering heard that a recent report of the International Resource Panel, an eminent group of resource experts hosted by UN Environment, found that sustainable management of the planet’s natural resources made sound business sense. The report, Resource Efficiency: Potential and Economic Implications , put the estimated potential savings from increased resource efficiency at about US$ 2.9 trillion a year for private investors. In 70% of the cases, the required investment would offer a rate of return greater than 10% a year. Annual global extraction of materials grew from 22 billion tonnes in 1970 to around 70 billion tonnes in 2010. For example, China used more cement in the three years 2011-13 than the United States used in the whole of the 20 thcentury. The richest countries consume on average 10 times as many materials as the poorest countries. A third of the world’s soils are degraded due to erosion, nutrient depletion, acidification, salinization, compaction and chemical pollution. Some 60% of global terrestrial biodiversity loss is related to food production. Effective resource efficiency policies could increase global economic activity by around 6% by 2050, compared to existing trends, as well as increase employment. The event, titled: “Sustainable Resource Management: Business Opportunities and Economic Potential”, was organised by ICC, the International Resource Panel and UN Environment and was hosted by the French Ministry of Environment, Energy and the Sea, and the French Ministry of Economy and Finance and the Académie Diplomatique Internationale.